The sun was shining early in the morning on day five. We got up and discovered that it was cold (no surprise there), but the wind had died down, which made us very happy. We ate oatmeal and shivered. I took a few photos of the campsite, but the immediate area was not very scenic with the creek bed completely dry. While we drank coffee, the sun gradually warmed things up. The combination of caffeine and warmth from the sun's rays quickly had us feeling much better. Our camp neighbor Farmer John was up now and the three of us talked about the trail and his adventures while Craig and I packed up. John is retired and lives in Hawaii where he grows tropical fruit to keep busy and for supplemental retirement income (hence the trail name). He thru-hiked the Appalachian Trail back in 1987, and had recently taken up hiking again as a way to get back in shape in order to enjoy his retirement for many years to come. He told us that his health had been declining – he was overweight and had high blood pressure – so he decided to fly to the lower 48, where he hiked 800 miles of the Pacific Crest Trail. He immediately followed this by flying east and hiking 500 miles of the AT before taking a break to visit family and plan where to go next. After discovering the SHT, he ordered the guidebook, flew to MN, and began the round-trip journey. He had lost 35 pounds so far and had grown a pretty impressive hiker's beard. We headed out onto the trail at 9:30 am. 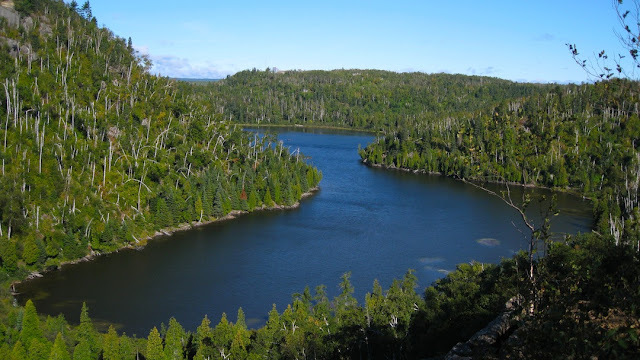 It was quickly becoming a beautiful day, and right from the beginning, we were awarded wonderful views of cliffs, valleys, ridges, Lake Superior, and inland lakes. We crossed paths with a family on the trail with a child of about 6. Just ahead of his parents, the kid was slowly dragging himself up the steep hill that we were descending. The parents both had enormous packs, and the dad's had a stuffed giraffe peeking out of it hilariously. Although we were tired, we both thoroughly enjoyed the hike on this day. We walked along a ridge above Wolf Lake, which is a beautiful curvy lake not far from Lake Superior. We stopped to take in the view, and from where we stood, we could see both lakes if we looked just slightly to our left. This was one of our favorite spots on the trip and would be a spectacular place to live. Wolf Lake. Lake Superior is just a little to the left. The next two hours were spent hiking up and down the ridge, with almost continuous great views. We stopped for short breaks here and there, and just before we reached High Falls, we walked through a shady tunnel of fir trees. We heard a loud racket in the forest and thought that we might finally see some exciting wildlife, but it turned out to be a big pileated woodpecker noisily making its way through the thick trees. A spur trail led us to a long, steep staircase to the base of High Falls on the Baptism River. Once we saw this place, we decided a long lunch break was in order. Or maybe a permanent stay – it was not an easy place to leave. 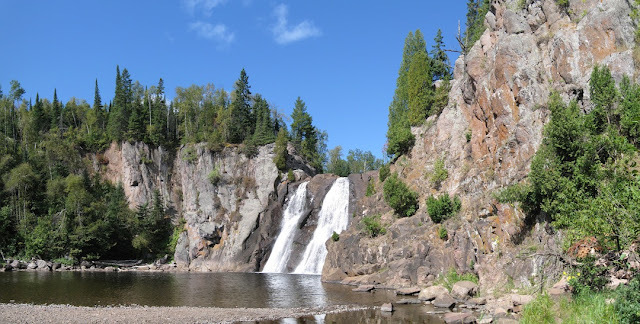 This part of the trail travels through Tettegouche State Park, and this waterfall is accessible to day visitors. Despite this, there were only two other people there with their dog until Farmer John caught up with us and decided to eat lunch there as well. The day had turned out gorgeous, and I couldn't believe how lucky we were to arrive here when the weather was good and it was not crowded with park visitors. We stayed here for an hour, and I took countless pictures now that my camera battery scare was over. Farmer John told us more of his hiking stories and showed us a few photos from his PCT trip. It was amazing to see his physical transformation. Now he was healthy and fit-looking, regularly covered 15-20 miles a day, and looked like he had never been out of shape. The photos showed a very different person, and he looked weird clean-shaven. He was pretty sure he was going to keep the beard. After reluctantly leaving High Falls, we followed the trail across a metal suspension bridge over the river near the top of the waterfall, passed a few confusing trail signs within the state park, then headed back into the forest. The next major encounter was a section of trail referred to as “The Drain Pipe,” a steep, 150-foot crevice with rock steps. It was scary to deal with, and I was extremely thankful that it wasn't raining, hailing, snowing, or icy in any way. A sign announcing its presence is attached to a cedar with a sinister-looking tangle of roots. We stood staring at the rocky climb for a few minutes, and Craig commented that it looked like a cataclysmic event happened to make this section of trail. I attached my trek poles to my pack and hauled myself up, the whole time aware that one slip or wrong move would pitch me backward and that things would go very badly from there. A few hours after leaving High Falls, we were tired and getting ready for a break. Craig mentioned that he hoped we found a good resting spot soon, and less than 30 seconds later, a bench suddenly appeared in the middle of a clearing near a trail junction. Magic! We took a break with our packs off here, and Farmer John caught up with us again. Although he hikes much longer distances than we do, he is very social and often stops to chat along the way, which is why he kept "catching up" with us (not because we were faster). We ended up hiking the rest of the day with him, and the afternoon was filled with awesome views, just as the morning had been. We climbed a dome called Mt. 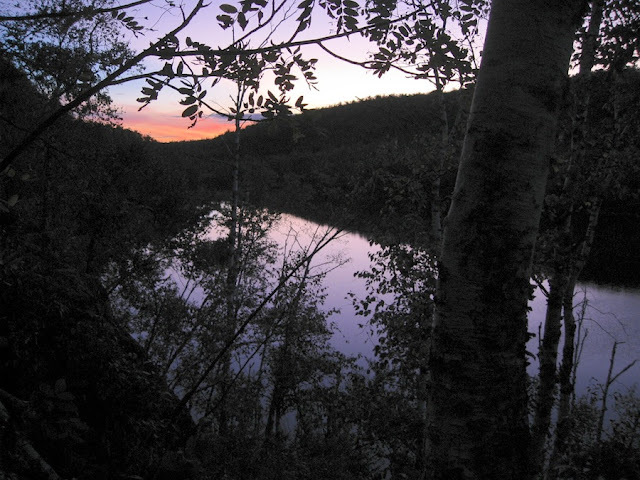 Trudee, which provided far-reaching views of the forest and a few small lakes. A little further on, the Bean and Bear Lakes area was our destination. There is a campsite directly on the shore of Bear Lake, which is supposed to provide space for a few tents, and we were looking forward to stopping for the day and having a relaxing night at camp without having to hide from the weather. Unfortunately, the campsite on Bear Lake was taken, which was disappointing for a few reasons: 1) it was awesome and truly right on the shore of the beautiful lake; 2) we had to hike down a very long, steep hill to get to it, which we now had to hike back up; and 3) we were really tired at this point. Luckily, a few makeshift, overflow campsites had been created at the top of the hill just off the trail, probably because this happens a lot. A hand-written sign attached to a tree dubbed this area “The Rest Stop”. It is actually a decent place to camp; the lake below can still be seen through the trees, and there was plenty of space for Craig and I and Farmer John to set up separate camps, each with it's own fire ring. We were very excited to finally have a campfire, since we had not yet done so, mostly due to the extreme wind. We were not excited at the lack of privy (it was located near the real campsite down at the lake) or the fact that the steep hill had to be descended and climbed once again to collect water from the lake. I was glad that this extra campsite existed, however, and that we didn't have to keep going to find somewhere else. It was close to getting dark, and the cold was quickly creeping up on us along with the setting sun. We quickly set up camp, and I collected wood and started a fire while Craig revisited the lake for water and began preparations for dinner. It was nice to have a fire at last, and we stayed up for as long as we could to enjoy it. Once all of the wood had been burned we turned in. Our feet were very sore and it was another sub-freezing night, but the day's experience had been worth it. I laid awake in the dark listening to a loon calling out across Bear Lake and felt extremely happy to be right where I was, despite the cold and uncomfortably hard ground. We had just a few miles to hike the following day back to the car, and even though I looked forward to driving to a restaurant and eating everything in sight, I was sad that it was coming to an end. Very cool. As always, I enjoy vicariously hiking through your blog! Can't wait to hear about the last leg. Same here as DC. B.